Whilst cleaning out my drawer over the weekend, I found a couple Walmart gift cards. Hooray! So, last night, I drove on over to Wally World and purchased a fancy new blu-ray player. It’s one of those that allows you to stream Netflix, Vudu, Pandora, etc. After we put the kids to bed, I plopped myself down onto my bed and started setting up my new toy. I got the thing connected to our wifi, then pushed the “Netflix” button to set up Netflix. To my surprise, Netflix popped up as if I’d already logged in. I scrolled down a bit. “Top 10 recommendations for Bob” (His name is actually different, but it’s not a terribly common name. So, we’ll call him “Bob” to protect his identity.) “Well, that’s weird.” I thought to myself. Then, I solved the mystery. Someone named “Bob” had previously purchased (and subsequently returned) this blu-ray player. Apparently he had forgotten to delete his Netflix account info before he returned the player to Walmart. I started to reset the blu-ray player so that I could sync my Netflix account. Wait a sec. I have been given power over Bob’s Netflix account. Some wise movie character once said: “With great power comes great responsibility.” Perhaps I should send a message to Bob somehow via Netflix. Challenge accepted. 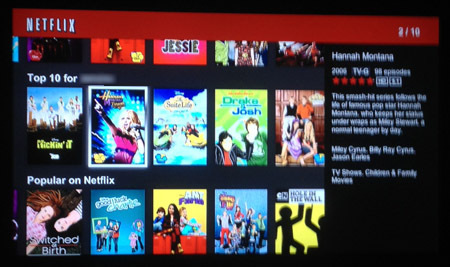 I figured Bob might find it funny if his “recently watched” list was full of nothing but iCarly, Bieber, and Disney junk. 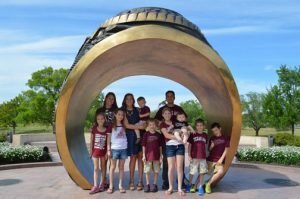 Well, apparently Bob has kids because his “recently watched” list was already full of that type of stuff. Plan B. I scrolled up to Bob’s Instant Queue. Bob, God bless him, has a few less-than-child-appropriate titles on his instant queue. Perhaps I should replace these with something more wholesome. Like Veggie Tales. For the next 15 minutes or so, I replaced everything on Bob’s Instant queue with movies like “Veggie Tales: Where’s God When I’m Scared,” “The Passion of the Christ,” “Fireproof,” etc. I’m not sure what Bob is going to think about all this. Perhaps he’ll think that God is trying to speak to him via his Netflix account. Sorry, Bob. It’s not the hand of God in your Netflix account. It’s a punk Walmart shopper. 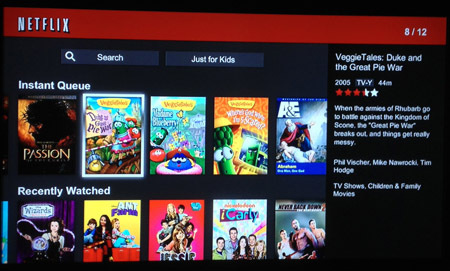 Enjoy your Veggie Tales. Again, sorry, Bob. Don’t worry, I’ve reset the player now. Your account has been deleted from my player. So, if your Instant Queue changes again, it’s probably God trying to send you a message. Next post Surprise, world. We have some news to share.